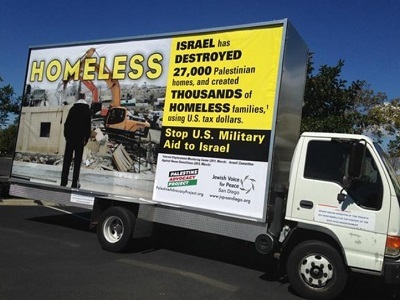 Commuters in cities across the United States were surprised this month to find their daily trips to work adorned with posters and banners calling on their government to end military support to Israel. Messages decrying Israel’s demolition of Palestinian homes, its incarceration policies targeting Palestinian children, and its construction of Jewish-only settlements in the West Bank and East Jerusalem are among the themes tackled by the ad campaign, whose launch was timed to coincide with Israeli Prime Minister Benjamin Netanyahu’s visit to the country earlier this month. “American tax dollars help the Israeli government maintain a brutal military occupation of Palestinian territory, which has denied Palestinians their basic rights for decades. These ads show what Israel’s occupation and apartheid really look like, and it is important for Americans to see that,” project board member Jake Chase-Lubitz said in a statement released by the group. The campaign is part of a broader push to ensure that Palestine remains on the radar of the US public, particularly as attention has shifted following the end of Israel’s massive assault on Gaza last summer.